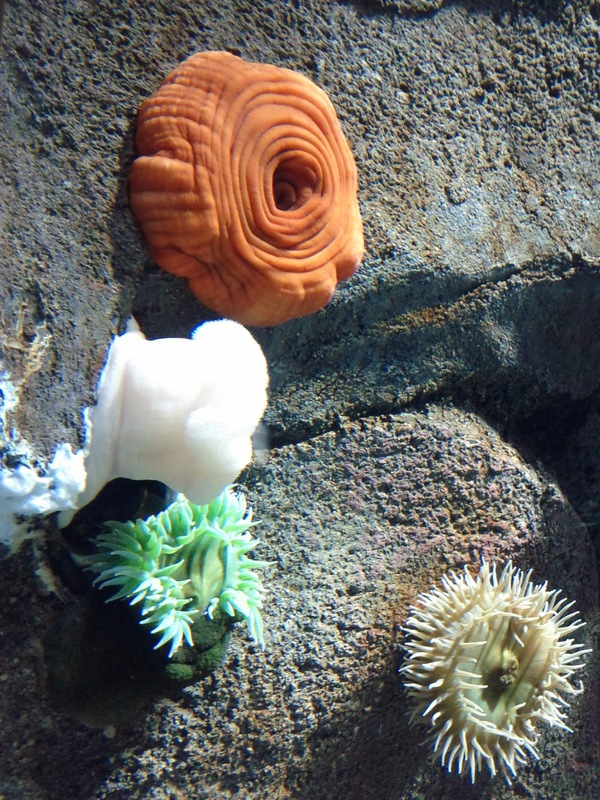 I went to Ripley's Aquarium. It was totally worth the $ 30 entrance fee. Look, eels! 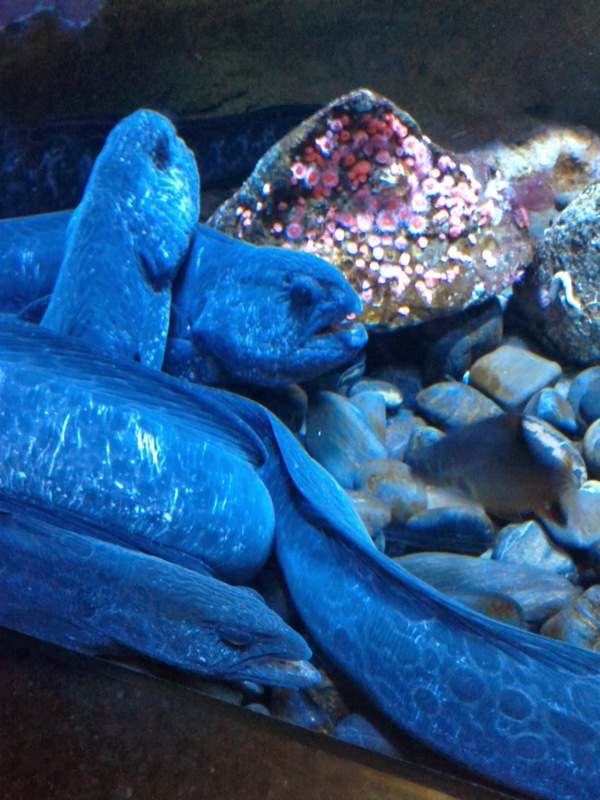 These are plain old eels. 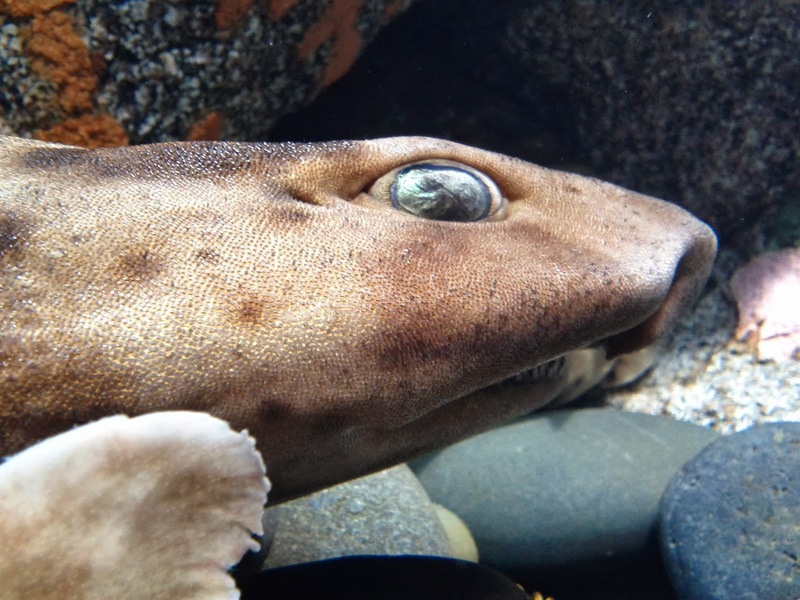 Further along, there was an electric eel in a tank that gave real-time feedback of the eel's electrical output. The feedback was in the form of a zig-zaggedy digital readout, and a sound that goes "GZZZT". I found the constant GZZZT-ing a bit ominous so I moved along quickly. These are sea pens. As in, they resemble old-timey quill pens. 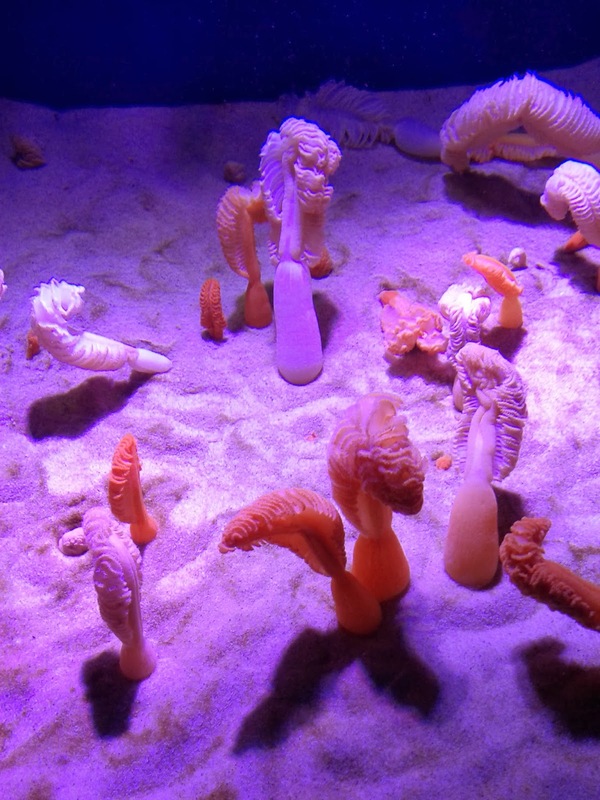 If you touch them, they emit phosphorescent mucus. At least, that's what the display panel said. I didn't get a chance to test that out. They were waving back and forth in the water looking... very fleshy. 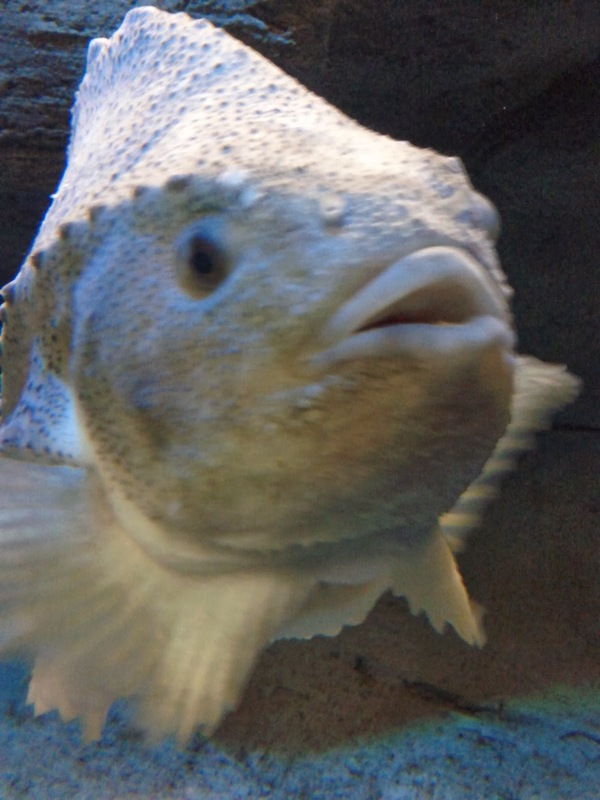 This lumpfish was approximately the size of a loaf of bread. I thought it was a pretty big fish until later, when I encountered an 800-pound grouper. I swear that grouper was as big as my desk. Gi-freaking-normous. Unfortunately, the lighting in that area was not conducive to photos with my lame little phone camera. Don't you just want to drizzle some icing on it and take a bite? 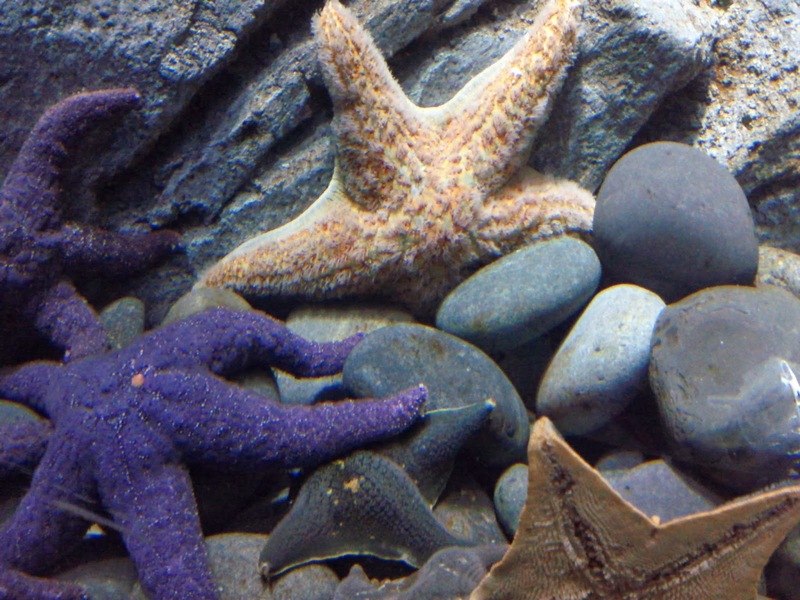 Sea stars. I did not know these came in purple. Cool. 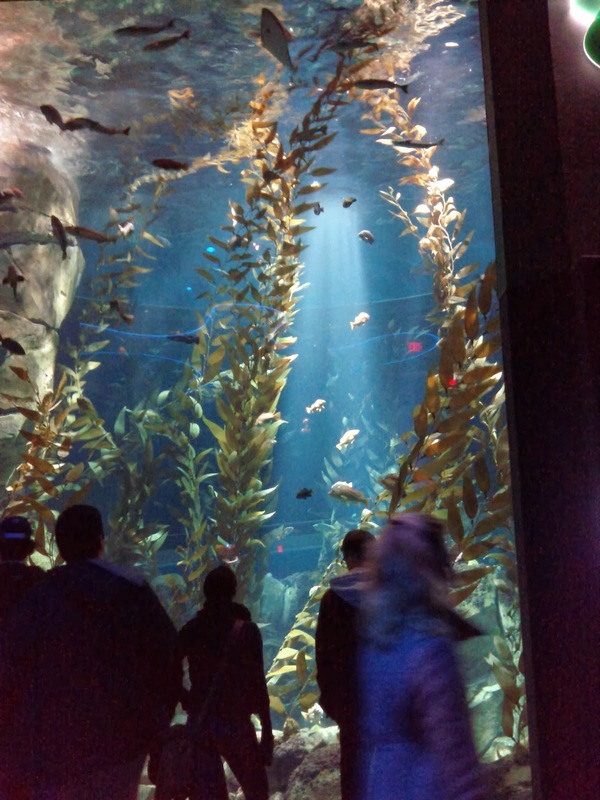 The Pacific kelp forest was beautiful and enormous. A wave machine had the whole tank in constant motion, especially up near the surface. 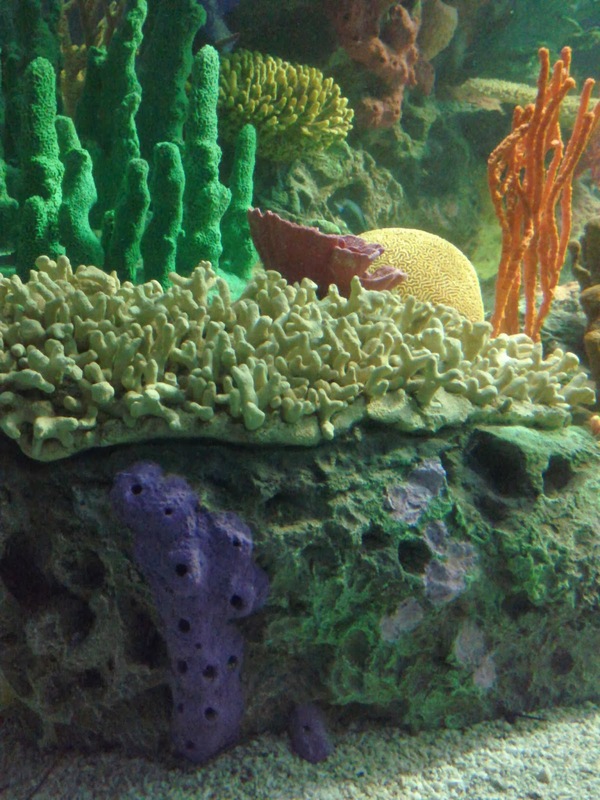 It was really neat to see the entire 3-D field of sea life moving with the water. There's no land-lubber equivalent, except perhaps a flock of birds flying in synchrony. Everything I saw was backed by atmospheric, film-soundtrack-type music, piped in to enhance the otherworldly experience. I'm sure it was also to drown out the sounds of the many pumps and other machinery it takes to keep the place going. I think if I worked there and had to listen to it non-stop it might make me want to shoot myself, but for my own visit I enjoyed it. The Dangerous Lagoon was the highlight of the tour. 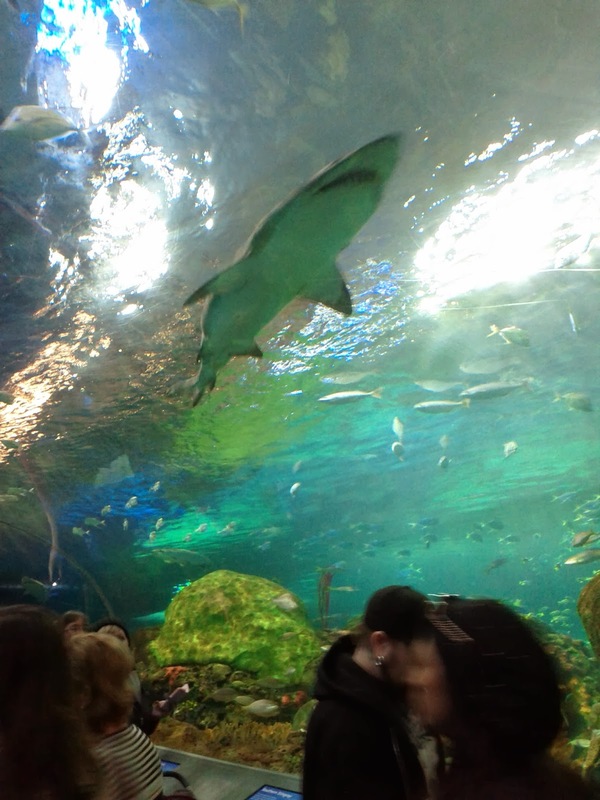 A moving sidewalk brings you through a tunnel under the biggest tank of all, full of sharks, rays, and a zillion smaller fish of every description. It's eye-poppingly gorgeous. It is also possible to step off the moving walkway to take photos or just gawk to your heart's content. 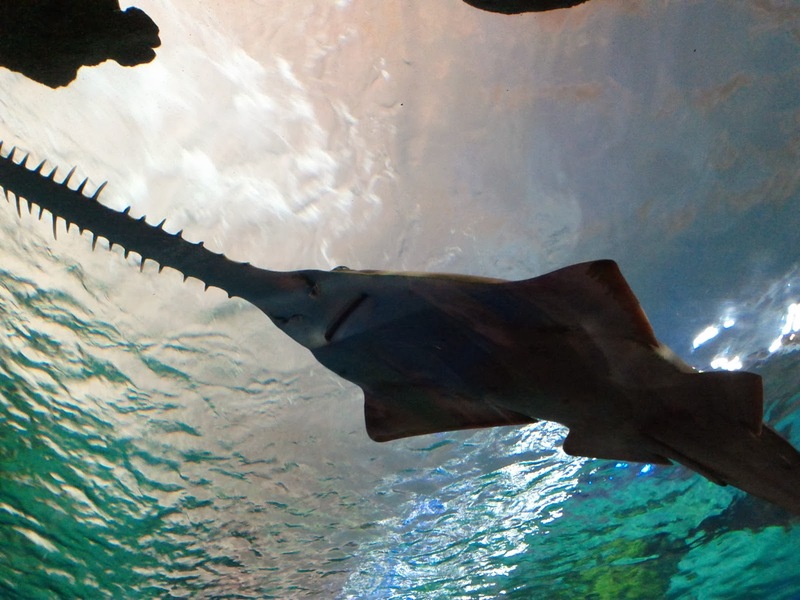 Sawfish! It was tough to get photos of some of the faster-moving creatures on account of the dim light. Slow shutter speed + zippy stingrays = nothing but a blueish blur. 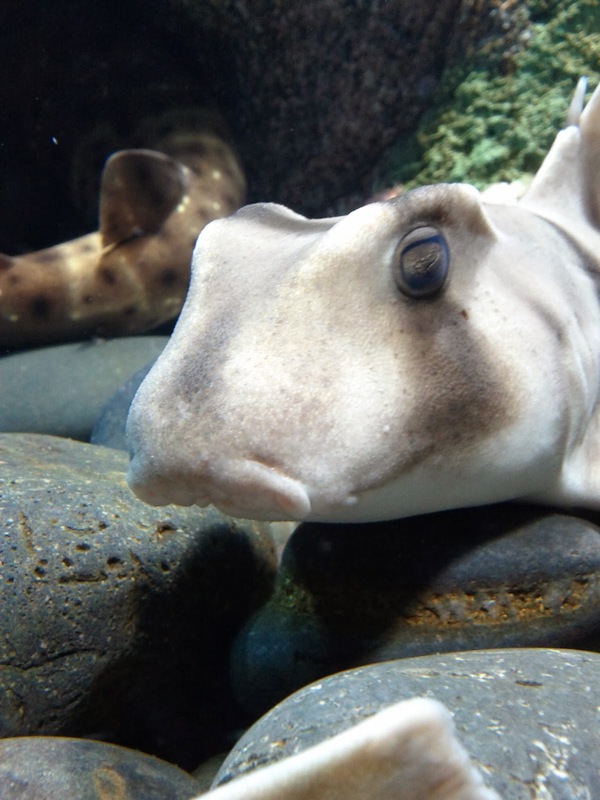 Not to worry, the website has some pictures of the stingrays for you. Don't ask me about specific species names and whatnot. I didn't have time to read all the signage. I wanted to look at creatures! Maybe I'll read the signs next time. The jellyfish were also stunning, but by the time I got to that section my phone battery was almost dead. But trust me, they were fabulous. Basically I would like to gather all of you together for a group tour of the facility. We would bring good cameras to take pictures of each other getting photobombed by crazy fish-beasties. And make sure you wear a shirt with sleeves that roll above the elbow so that you can reach into the Touch Tank and pat a stingray. Who's in? Count me in!! Oh... I fondled a stingray at the Columbus Zoo already. They are slimier than I thought they would be. Fun! 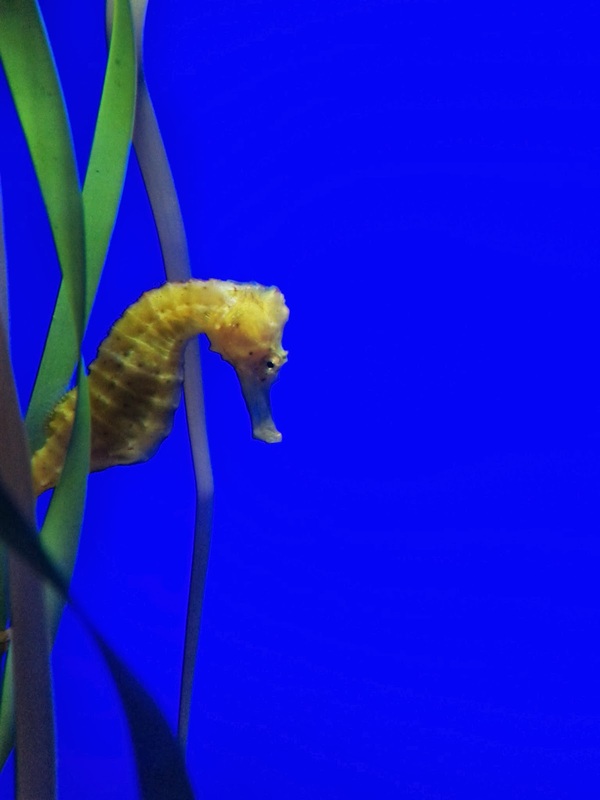 I love the seahorse. I'll be up next weekend (not really, but in your lets-get-together-plan I would be). You are so right that $30 was a bargain price for the tour. I would absolutely love to go there. This is off topic, but I am a bit concerned about what is standing in the lower right hand corner near the shark tank. Often my eyesight plays tricks on me, but it looks a bit like a gorilla in a ball cap or some other creature in disguise. The only bit that would bother me are the photos of one another. Now that's scary. The rest sounds fun. I love aquariums! One just opened here and I can't wait to take Amir when he's a little older! Joey: Thanks! Okay, no worries, we'll get you to be the photographer. Lynn: They have horseshoe crabs in a touch tank too, if you prefer. I skipped them myself. I already know what a shell feels like. I wish I could have gone with you - looks like it was a great time. My Welcome Mat Says "Go Away".